France in London | Where to celebrate Christmas the French way? Where to celebrate Christmas the French way? For the Brits, Christmas Eve is almost just another evening, nothing exceptional normally happens that night except that the children are perhaps more excited than usual and that you might be wrapping up presents late into the night once they have finally made it to bed. In France on the other hand this is a special evening of celebration. For French people, Christmas eve is the most important part of Christmas. It’s traditional to have a big dinner with all the family. Foie gras, oysters, roast turkey with chestnut or goose, good wine and of course champagne and the Christmas log are all part of the tradition. Of course, you could celebrate Christmas at home but if you do feel like cooking or if you are simply visiting London, you might want to know where you can get it just the French way. Experience Christmas in the Aquitaine’s style at Bord’eaux. 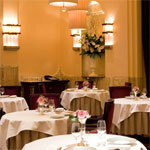 Located on Park Lane, this classic brasserie will offer you a unique blend of elements of a traditional Christmas season from the Aquitaine region. On Christmas Eve, you’ll be able to enjoy a complete menu for only £60. I would recommend you to go for some typical French Christmas courses, such as the Foie gras terrine with Pineau des Charentes jelly and toasted brioche, and the traditional roast turkey. But the menu offers also other choices, which should please everyone (also the vegetarians!). And to make your evening more festive, Bord’eaux will offer some live entertainment. The brasserie will also be open on Christmas day. If you want an elegant dinner, taste some Traditional Haute Cuisine, and if you’re not afraid to spend some money, you can choose to celebrate Christmas Eve at Claridge’s restaurant. Famous Chef Gordon Ramsay will offer you a five courses meal for £100. Your taste buds will sure be delighted by the very fine food, such as the ballottine of foie gras, poached in Sauternes with a salad of green beans, the black truffles, or the fillets of dorade on an orange glazed endive with vanilla sauce. The entertainment will unfortunately be kept for Christmas day. On 25th December, Santa Claus will visit the restaurant and offer presents to all the ladies and children. Christmas Eve Menu: 5 courses for £195 (not inclusive VAT or service charges) £100 for kids under 12. 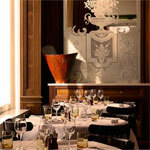 The brasserie inspired by the notorious French Chef Albert Roux situated at the 8 Pall Mall and offers classic French brasserie cuisine at a very reasonable price. And in these times of credit crunch, some of you will surely appreciate the £38 festive menu, available from 8th to 24th December. Ok, you won’t have foie gras for this amount, but here is a little overview of the different choices you’ll have for your three courses: organic smoked salmon and Cornish crab with mango and pink pepper dressing or free range chicken mousseline with roquefort for starters, fillet of sea bream with salsify and grey shrimps or roasted pumpkin, wild mushroom and chestnut risotto as main course, and chocolate and chestnut bûche de Noël for dessert. Another good place to celebrate Christmas without ruining you, would be Gastro. 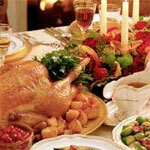 With prices from £19.50 to £39.50, their Christmas menus will suit all tastes and purses. And I can assure you that no self-respecting Francophile gourmet will be disappointed! Even with the first menu, you’ll have a great choice: Oysters, terrine of rabbit, fillet of dorade, tatin de Rouget, bûche de Noël… But the £39.50 menu is classier of course. The seafood platter, the foie gras, or the ballotine of salmon and monkfish will for sure, delight every gourmet. Opened on Christmas Eve and Christmas Day. Christmas Menus: £19.50 (three courses), £24 (three courses but with a larger choice and a cheese platter), £39.50 (four courses). These menus are available from 1st to 30th December. 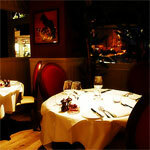 Awarded best local restaurant by Time Out in 2008, Le Cassoulet is a country style French bistro. Christmas Eve would be a perfect occasion to try its rustic cuisine based on the dishes and specialities of South West France. 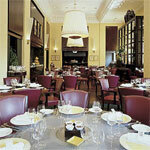 Its set menu does not offer a large choice, but the high quality of the dishes makes up for the lack of choice. In fact, one will have to decide between a ballotine of Foie gras and a goat cheese tart with black truffles for starters, between fillet of aged rump with foie gras sauce and fillet of wild sea bass with wild mushrooms risotto for the main course… And I let you be surprised by the desserts! 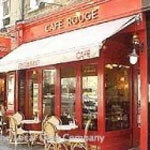 The Wellington Street’s Café Rouge offers good bistro food for this type of chain. The meals are simple but its set menus are great value for money. So, if you want to spend Christmas Eve in an easygoing atmosphere and be kind to your bank account, Café Rouge is the perfect pick. 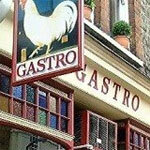 Its party menu costs only £23.95 and includes three courses, among which you will find a terrine of pork with apple & cinnamon chutney; some butterflied king prawns grilled with garlic butter; stuffed roast turkey with a caramelised onion, chestnut and sage; Christmas pudding or vacherin glacé. And to ensure a lively Christmas ambience, the deck will be up and some music will be played. Christmas menus: three courses for £23.95, served on Christmas Eve and all through December; special menu on Christmas Day for £40.